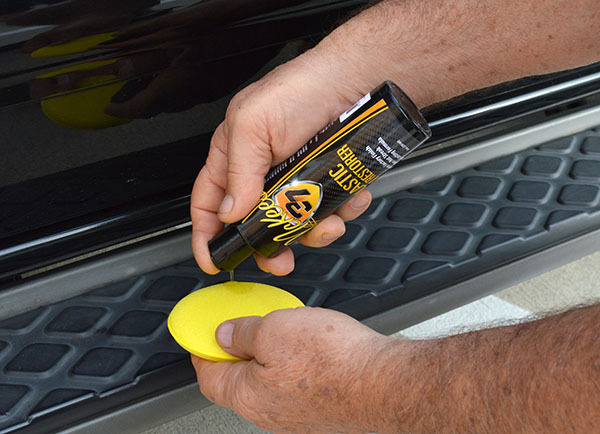 McKee's 37 Plastic Trim Restorer is the car care product you've been waiting for! What is arguably best described as magic in a bottle, McKee's 37 Plastic Trim Restorer injects new life into old, faded, discolored exterior plastic trim. Do you think the chalky, faded plastic trim on your vehicle is too far gone? Think again. McKee's 37 Plastic Trim Restorer will make it look new again by restoring a rich, black appearance! Best of all, it only takes minutes to apply, yet the results are long lasting. McKee's 37 Plastic Trim Restorer was formulated with the daily driver in mind. Do you run your vehicle through the car wash frequently? That's not a problem for McKee's 37 Plastic Trim Restorer. This robust polymer formula is designed to withstand repeated washes without running or streaking. In fact, McKee's 37 Plastic Trim Restorer causes water to bead up and roll off plastic trim, much like your favorite wax does for painted surfaces! Plastic Trim Restorer is a clear formula, so it's not going to stain your hands. Apply using a foam applicator pad. The best time to start using McKee's 37 Plastic Trim Restorer is RIGHT NOW! Do you wait for your paint to dull and oxidize before you wax it? No! Using McKee's 37 Plastic Trim Restorer on a new vehicle is cheap insurance for keeping the trim looking brand new. Why wait until it starts to fade before coating it with McKee's 37 Plastic Trim Restorer? New cars, old cars, foreign cars, and domestic cars ' they all benefit from McKee's 37 Plastic Trim Restorer. 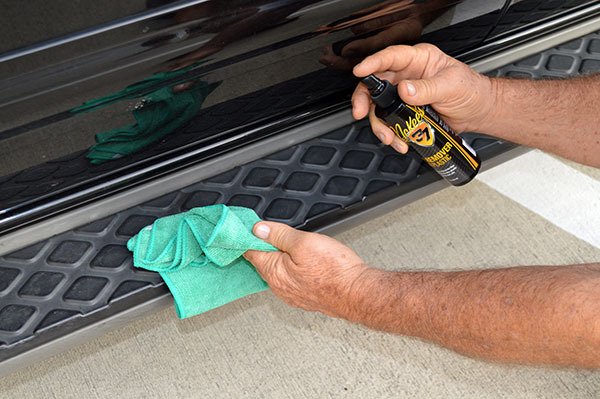 Plastic Trim Restorer dries 100% to the touch, and it will not streak or run when it gets wet! Each application provides months of protection. McKee's 37 Plastic Restoration Combo Free Applicator! Love it! 5 By using the square applicator, the job of making your black plastic trim look like new, or better, has become my favorite detailing task. This product gives me the biggest bang for my effort in making my vehicle look great. Love Plastic Trim Restorer!!! Pros:Easy to use and lasts a long time. Plastic Trim Restorer 5 Wow! This is a fantastic product and the best trim restorer I have ever used. Keep up the good work and thanks for all the great products from you guys. Pros:Coverage and ease of application. Yep!! 5 Great stuff. Cleaned up the wax on my trim with Wax Remover and then put this stuff on. Looks great. I used the applicator sponge which seems to be a one-time only item. Next time I'll try a cloth which can be washed. Love this guy 5 I've tried everything on my Honda's plastic trim and nothing has worked until McKee's 37. Awesome product! Excellent!! 5 I used the plastic trim restorer immediately after using the wax remover spray on my '16 Silverado. Plastic trim restorer made all of my trim totally black again and truck looks better than it did when new. Pros:Easy to use. Works as advertised. Good stuff! 4 Its very good! Some trims soak up and dont become as dark as when its applied. Its also lasts in the rains, so far still going strong. The only complaint I have is that it's not available in larger bottles, I'd like to purchase by the gallon, or at least in some higher quantity at a discount. We are a volume operation, and buying small bottles at this price makes it more expensive per car than most pther products I've used.